Lip-syncing law enforcement has taken Texas by storm. It all started with one video posted on the Bexar County Sheriff Department's Facebook page. The video -- which went viral and now has over 1 million views -- shows Deputy Alexander Mena lip-syncing to a song called "Fuiste Mala" by the group The Kumbia Kings. His suave serenade stole many people's hearts, and also inspired other officers to join the fun with their own videos. 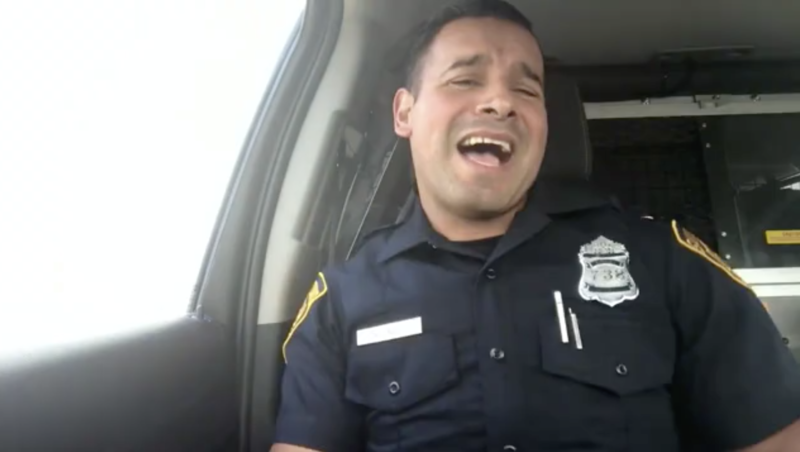 A few days later, San Antonio Police Officer J. Quiroz felt inspired to film his own lip-sync. Sitting in a car just as Deputy Mena did, Officer Quiroz took a video of himself mouthing the words to a crowd favorite: *NYSNC's "Bye Bye Bye." This video also went viral, and the hashtag #Lipsyncbattle got people debating which officer did the best. Was the Tejano classic from Deputy Mena the winner? Or was it the nostalgic 90s boy band song from Officer Quiroz? Well, the friendly competition did not stop there. Two officers with the Robstown, Texas, Police Department shared their own lip-sync. At first, they stuck with the 90s pop theme, singing The Backstreet Boys' "Everybody (Backstreet's Back)." In the Robstown video, Jimmie Zamora and Jordan Armstrong sit side by side in a patrol car. "Hey man, he's pretty good," Officer Armstrong says referring to Deputy Mena's video. "It's almost making me want to come out of retirement." "I think it's about that time," Zamora replies. The music starts and the two mouth the first words of the 90s classic: "Oh my God, we're back again. Brothers, sisters, everybody sing. Gonna bring you the flavor show you how. Got a gotta question for you better answer now." Before they can get to the next part of the song, the officers stop -- but their lip-sync performance is not over. "You know what, that's good, but we got to show them how it's really done here in South Texas," Officer Zamora says. Then, Selena's "Bidi Bidi Bom Bom" begins playing. The Robstown officers honored the Texas native with their lip-syncing rendition of her 1994 hit. The two also reposted a 2015 video of themselves lip-syncing to Taylor Swift and Cyndi Lauper, with the notation "Everybody talking about that Bexar County Deputy.. We were originators 3 years back baby!" Whether or not you're a 90s baby from Texas, the collection of videos can brighten anybody's day. The debate over who won the lip-sync battle continues online.